About two minutes from my house is a tiny little dive bar called Sweet Fire BBQ, and every Wednesday they have $.25 wings. So for about three, maybe four months, a group of us has been going nearly every week. It’s usually my sister and her husband, myself, and one or more of my other brothers and sisters. Sometimes our ginger friend comes a long, but not usually. Once we got a whole group of visiting friends over there and made a party of it. But usually it’s about five of us. We’ve been going since my sister was about 8.5 to 9 months pregnant, and ever since her baby’s been born, she’s been bringing him along too. We sit in the biggest booth and the bar tenders come over and coo over the little guy while we feast ourselves on spicy hot wings. Today being the second day of school and all, I was particularly eager to get to the bar for a cheap beer and my share of wings. The parade accompanied, and we made it through dinner and were about to pay our bill. My sister, who was holding the baby and babbling on about how cute he is let out a little squeal. Looking over it was easily apparent why. 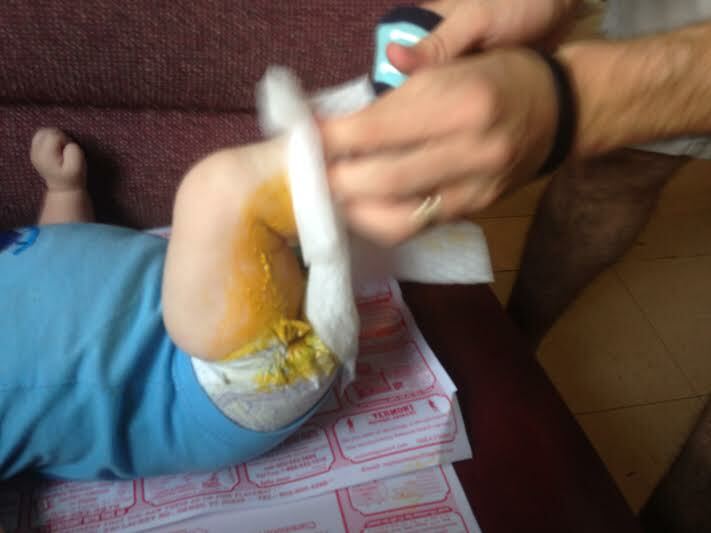 Her arm was extended away from her, displaying a long yellow trail of mustard-like baby poop descending towards her elbow. Upon further inspection we realized that little Liam had really outdone himself. 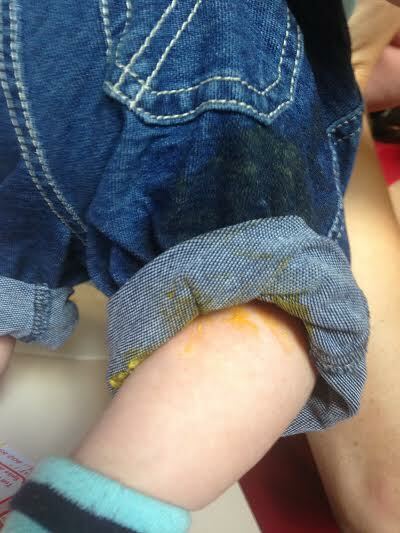 His diaper had overflowed and the goopy yellow gooeyness was everywhere inside his tiny little jeans. Following the logical course of action, I took numerous photos. My brother-in-law was laughing nearly as hard as I was as my sister insisted he take the baby. We quickly calculated that the paper place mats wouldn’t be enough to contain the mustard, so he needed to be changed immediately instead of taking him elsewhere to do so. Plus, we’re in a bar, the bathrooms definitely wouldn’t have a changing table. So my brother-in-law proceeded to strip little Liam of his clothes for all the world to see, and changed his poopy little (big) diaper right there on the seat of the booth. Giggles were had throughout, but the best part was after the full 7 minute diaper change and wipe down, my sister went to the bathroom and returned with the news that there was in fact a changing table. Who’d have thought! And so our trip to the bar was not cut short, not lessened in any way, but instead provided an anecdote that I will be sure to tell all little Liam’s girl friends when he’s all grown up, as they’re sure to come a’knocking. OH! But the best part was when my sister was realizing there was poop everywhere and I told her she’d got a bit on her chin. The look in her eyes could melt ice in January. 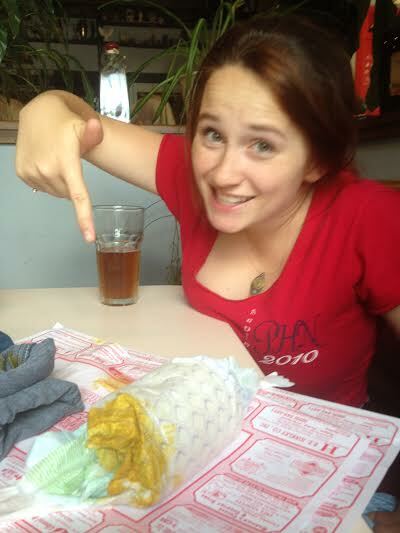 I thought she knew I was kidding but she scrambled for a napkin and began to feverishly rub at her face. Priceless.